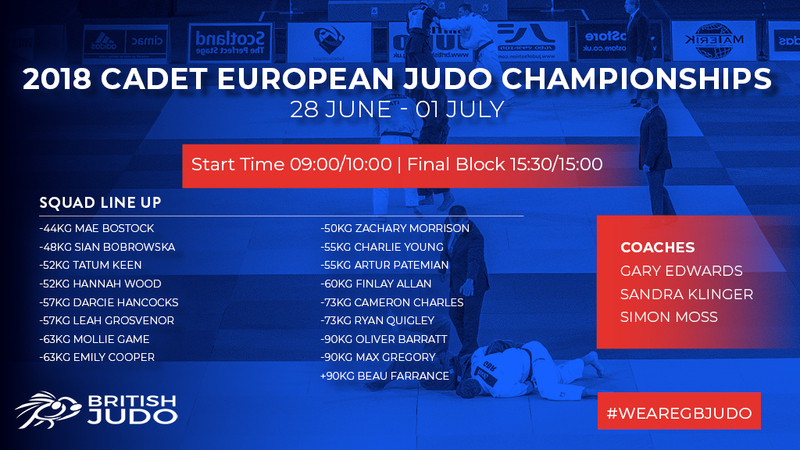 A 17 strong GB Judo Cadet team will step on the tatami at the 2018 Cadet European Judo Championships in Sarajevo, Bosnia-Herzegovina from Thursday 28 June to Sunday 1 July. Nominations and identification for the Cadet Europeans were made following the 2018 European Cadet Championships Identification Procedure with the final team identified in May. A number of the 17 judoka identified for the Championships having also tasted success on the international stage this year as well. Sian Bobrowska (-48kg) has had a good 2018 to date with gold and silver at the Fuengirola and Zagreb Cadet European Cups. -52kg Cadet British champion Tatum Keen also enjoyed success in Zagreb with silver. Darcie Hancocks (-57kg) has also picked up two Cadet European Cup medals with silvers in Fuengirola and Berlin as well as bronze at the International Thuringia Cup in March. Fellow -57kg judoka Leah Grosvenor also medalled in Fuengirola, taking home bronze. -63kg British Cadet champion Mollie Game is joined in the team by fellow -63kg judoka Emily Cooper who has won both the English and Northern Irish Cadet Opens in 2018. Hannah Wood will also fight at -52kg with the Scottish judoka having also won bronze at the British Junior Championships to go alongside with her Cadet bronze. Mae Bostock is on a strong run of form having won -44kg gold at the Cadet British Championships last year as well as winning the 2018 English, 2018 Northern Irish and 2017 Welsh Cadet Opens. Five of the nine male judoka identified for the Cadet Europeans are current Cadet British champions. Zachary Morrison (-50kg) backed up his gold in Sheffield with another top of the rostrum finish at the Sportif International in April this year. The 2017 -55kg gold and silver medallists from 2017, Charlie Young and Artur Patemian, will both be looking to bring that form to the mat in Sarajevo. Finlay Allan (-60kg) won silver at the British Championships last year and has added further medals to his collection in 2018. The -73kg duo of Cameron Charles and Ryan Quigley occupied the top two spots at the British Championships and did so again at the English Open earlier this year. On both occasions it was Charles that took gold. Heavyweight trio of Oliver Barratt (-90kg), Max Gregory (-90kg) and Beau Farrance (+90kg) have all shown good form in 2018 at both domestic and international level. Barratt and Farrance both finished fifth at the Bremen Masters in March while Gregory came home with silver from the English Open. Team League Set for 3rd Outing 2018 British Schools Regional Championships Date Announced!